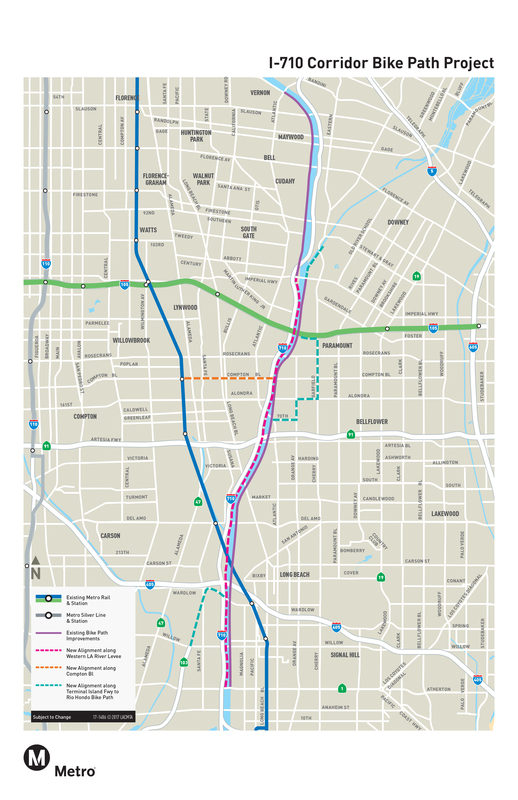 Metro wants to hear from you about three proposed bike paths that will serve bicyclists, pedestrians and transit riders traveling within the I-710 South corridor. Attend a public meeting to help us improve connections and transportation options in your community. 1) Learn about proposed bike path projects in or adjacent to the cities of Long Beach, South Gate, Compton, Carson, Lynwood, Paramount and Downey. 2) Provide feedback on what connections are important in these cities and neighborhoods. 3) Be involved in your community and meet other stakeholders. 4) Support walking and bike projects because they promote health and an active lifestyle. Tuesday, April 11, 2017, 6 p.m. to 8 p.m.
Wednesday, April 12, 2017, 6 p.m. to 8 p.m.
Thursday, April 13, 2017, 6 p.m. to 8 p.m.
To learn more about the project, please click here: www.metro.net/projects/i-710-corridor-project/. The project proposes to make a number of mobility improvements along the 710 freeway between the ports and the 60 freeway to help ease truck-related traffic and reduce air pollution. Among those are projects to help people travel by bike in and around the 710 corridor.